We arrived in Dickinson, ND on a very hot September 2nd. While checking in at North Park RV we asked if they knew of any RV repairmen that would come out to the campground, and explained that our AC had gone out. The owner felt so bad for us that she drove around the campground looking for the shadiest site she had. It wasn't easy seeing there are almost no trees anywhere in the camp. We got the one spot that had shade. It was 104 degrees when we were setting up, so even a little shade was nice. One of the jacks decided to give us some trouble again so set up took longer than usual. Poor Les was so over heated by the time he got done with the outside set up he came in and collapsed. Thankfully it cooled off and dropped into the 50's overnight. 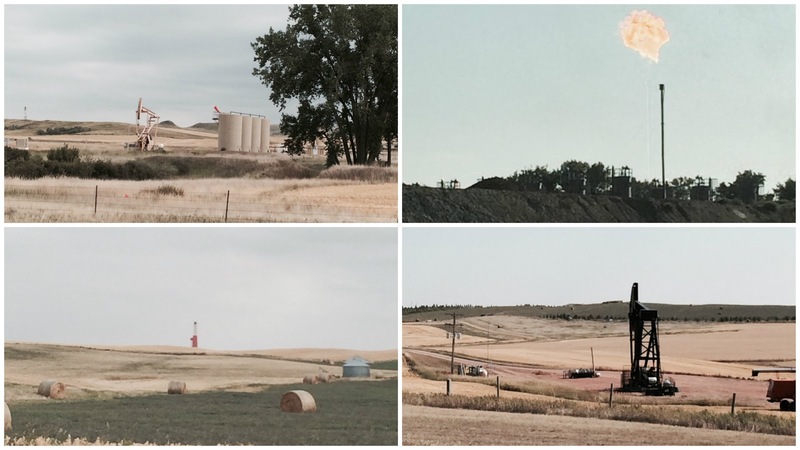 The campground is fairly big, there are a number of permanent residents, mostly oil and fracking workers. The sites where we were are very close together, enough room for a picnic table and that's about it, with a small patch of grass. The sites are also "buddy" sites so your door faces your neighbors door. Isn't too bad unless you and your neighbor are coming out at the same time with your dogs. The other section of the campground has no grass, but the sites are a little bigger. There was lots and lots of dust. 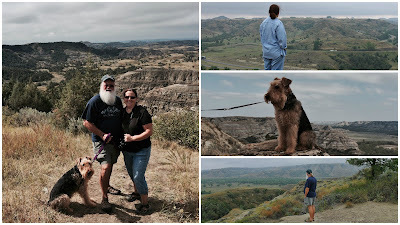 Bismarck, ND was one days destination. As usual it took us twice as long to get there because we got distracted by a 30 mile Roadside Oddity. We saw signs for the Enchanted Highway and of course with a name like that we had to explore it. We are so glad we did. It starts at exit 72 from I-94 with the Geese in Flight sculpture and heads south 30 miles to Regent. 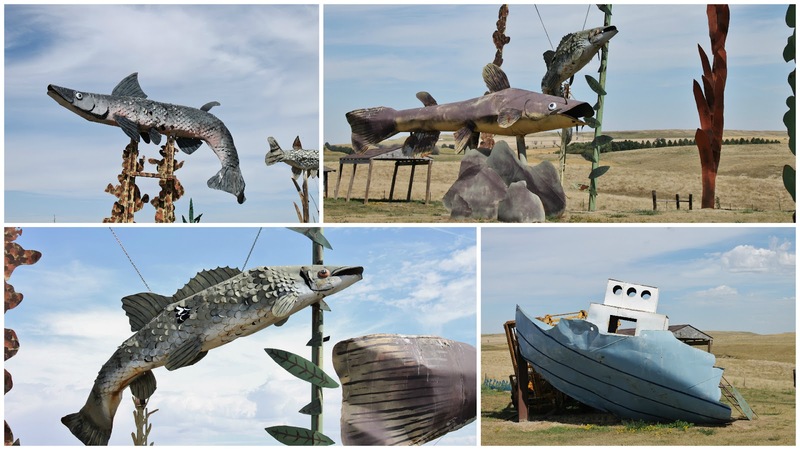 Local artist Gary Greff conceived of the project and started building it in 1989, with help from many local farmers. He maintains it and has plans for more sculptures. His goal is to counter the trend toward extinction of small towns such as Regent. Geese in Flight was built in 2001 and is in the Guinness World Book of Records as the largest scrap metal sculpture in the world. It weighs over 75 tons and is made from used oil well pipe and oil tanks. The sun ray is 156 feet long and 110 feet tall. The largest goose has a 30 foot wing span and is 19 feet long. The road leading to the sculpture is lined with poles topped with geese. Mielikki looks very small in front of the deer. The Deer Family was completed in 2001 and erected in 2002. It is made from old oil well tanks cut and welded together. The buck is 75 feet tall and 60 feet long. The doe is 50 feet tall and 50 feet long. 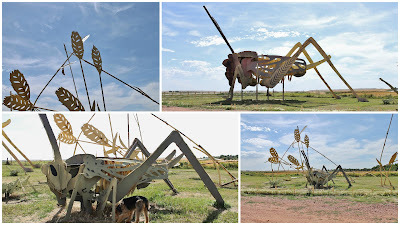 Grasshoppers in the Field was the fourth site erected, and went up in 1999. It is a reminder of the hardships farmers have overcome. They are welded from old fuel and oil well tanks. The largest grasshopper is 50 feet long and 40 feet tall. 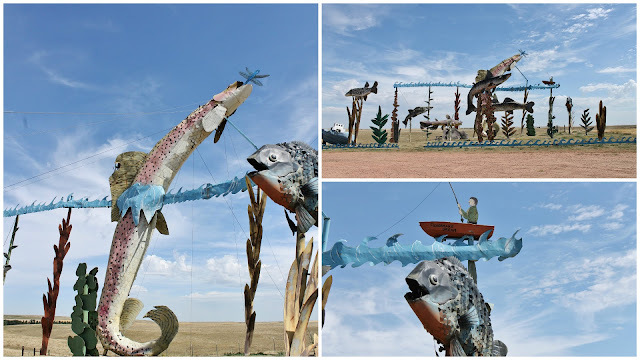 Fisherman's Dream, built in 2006 out of tin is an underwater scene that includes a small mouth bass, walleye, catfish, salmon and a bluegill that is 30 feet long. Jumping out of the water is a 70 foot rainbow trout. Most are now home to a number of birds. Pheasants on the Prairie took 3 years to complete and was erected in 1996. They are all wire mesh. 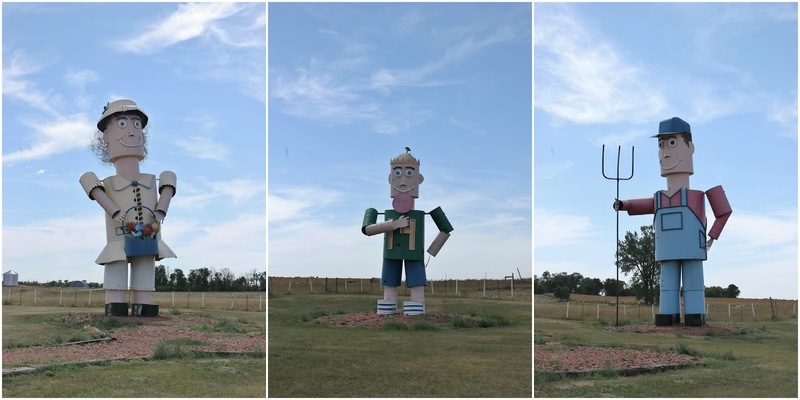 The Rooster stands 40 feet high and 70 feet long. The Hen is 35 feet tall and 60 feet long. The chicks are each 15 feet tall and 20 feet long. climbing up on that horse! 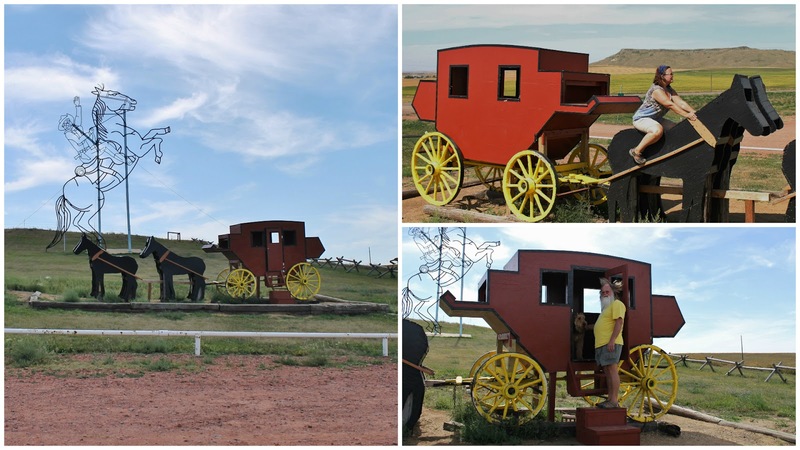 Teddy Rides Again is a tribute to Theodore Roosevelt's part in North Dakota's history. The sculpture was built of used well pipe and stands 51 feet tall and weighs over 9000 pounds. The stagecoach made for a fun place to take some pictures. The Tin Family was the first site erected. Built of used farm equipment in 1991, it took farmers hours of labor and welding to achieve this initial creation. The Tin Pa stands 45 feet tall and is held up by 16 telephone poles. The Tin Ma is 44 feet tall and the Son is 23 feet tall. It was so much fun, watching them show up in the distance as we drove. With the land fairly flat it was easy to spot them. Each one has a parking area, large enough for buses and a kiosk with picnic tables. Once in Regent we went to the Enchanted Highway Gift Shop and Visitor Center, filled with a number of trinkets that are replicas of the sculptures. They also have ice-cream and snacks. It was great except for the lady who was working there, she was the most unfriendly store clerk we have encountered in a long time. She never once spoke to us, not even while paying for the postcards we bought. Nancy asked where something was and she pointed and said "there". That was the only word we heard from her. We did make it to Bismarck, nice town. We explored a bit and then did our big town shopping. We stopped in Mandon which is across the river from Bismarck to get a picture of the North Dakota, Peter Toth Indian. It is in the parking lot of the Stop Stage Liquor store. 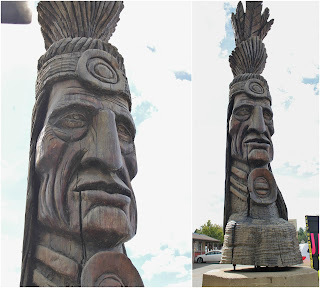 This one was carved out of cottonwood in 1981 and is 25 feet tall. 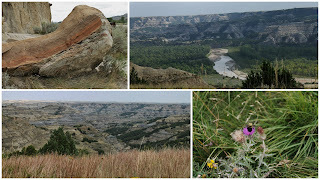 Besides the Perer Toth Indian, Theodore Roosevelt National Park was the other reason we came to this area. We went to the north park first, and in hind sight after doing the south park the next day we would have done them in the opposite order. We would suggest that the south be done first. 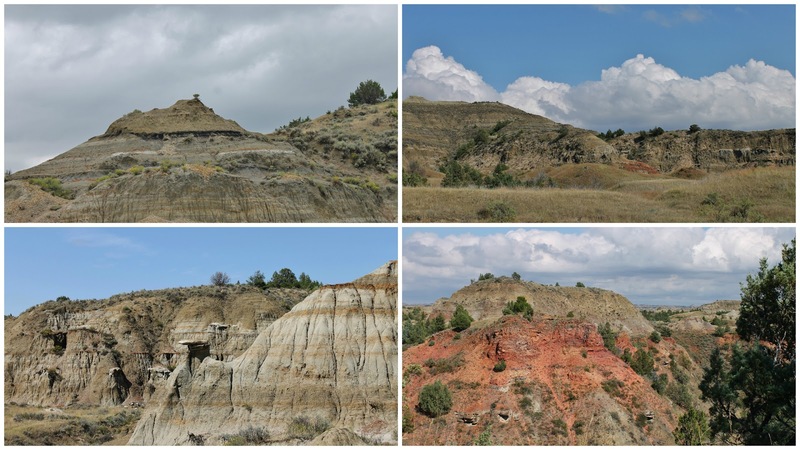 It is a beautiful drive on the scenic loop but nothing like the northern part. The views and sights are quite amazing. 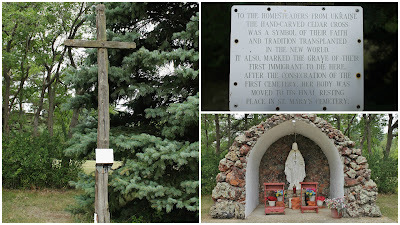 On our way north we came across another grotto. 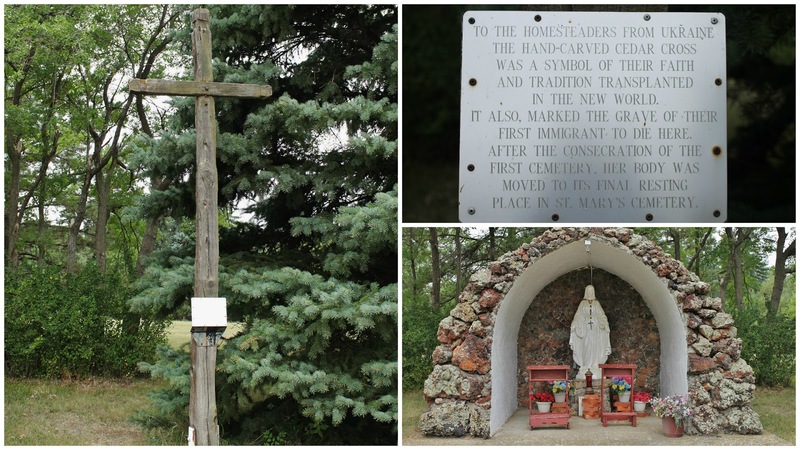 This one is on the property of St. Mary's Catholic Church. 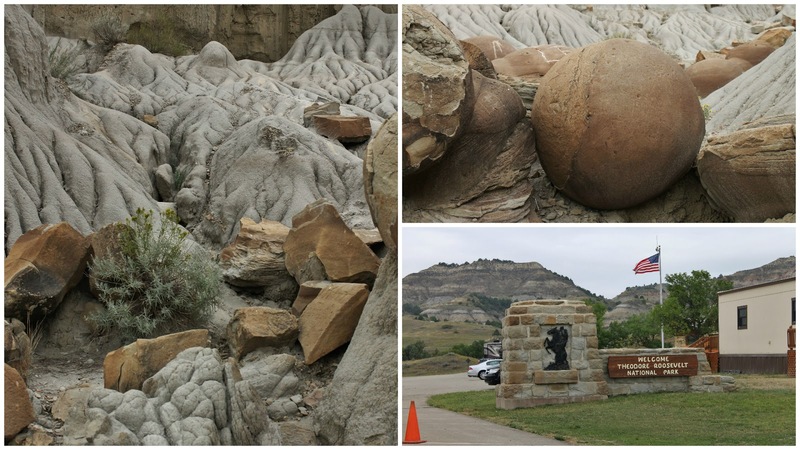 There was one section in the park that was called Cannon Ball Concretions. They are large spherical boulders. Some where on the ground and others sticking out of the walls, appearing as the wall erodes. They were pretty amazing. 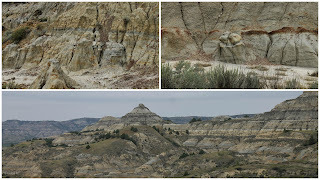 The rock formations and different colors never ceased to amaze us. 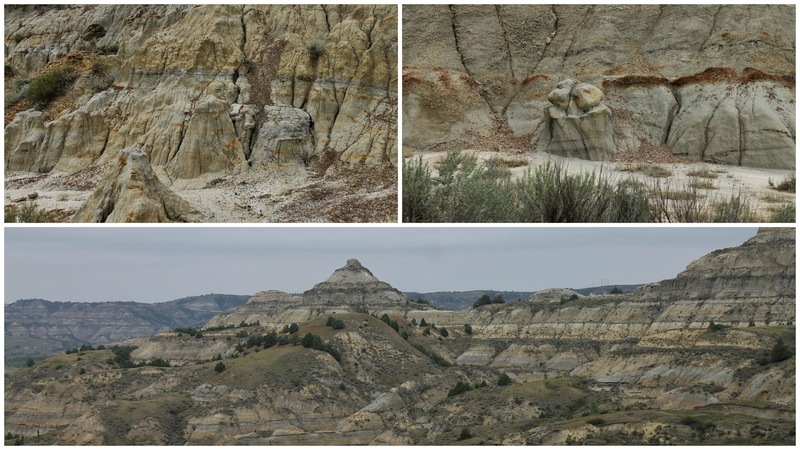 Some of the valleys were grass covered and others barren rock. We came upon this construction while in the park and loved the sign - what a great motto for life! While heading home from the park we ran into road construction everywhere. They are rebuilding the roads to accommodate all of the extra traffic from the oil and fracking wells. They dot the landscape like silos used to. It was rather depressing passing all of them. 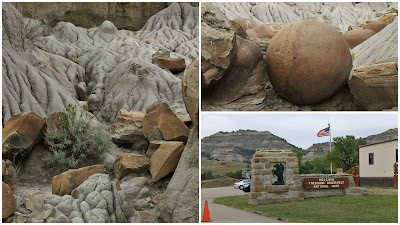 You enter the south portion of the park in Medora, WY. The town has lots of nice boutique shops, not the usual tourist stuff, and plenty of places to eat. 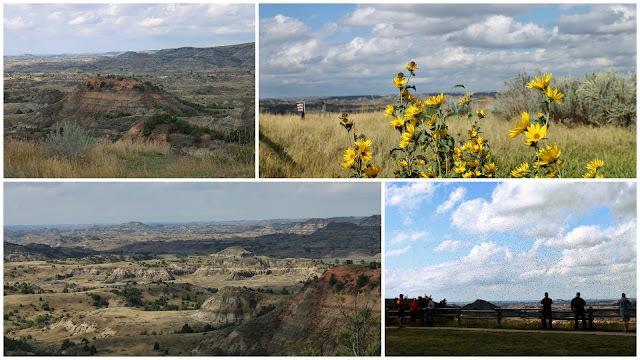 Once in the park we were struck by the difference from the north to the south almost immediately. There is much more green space and trees here. 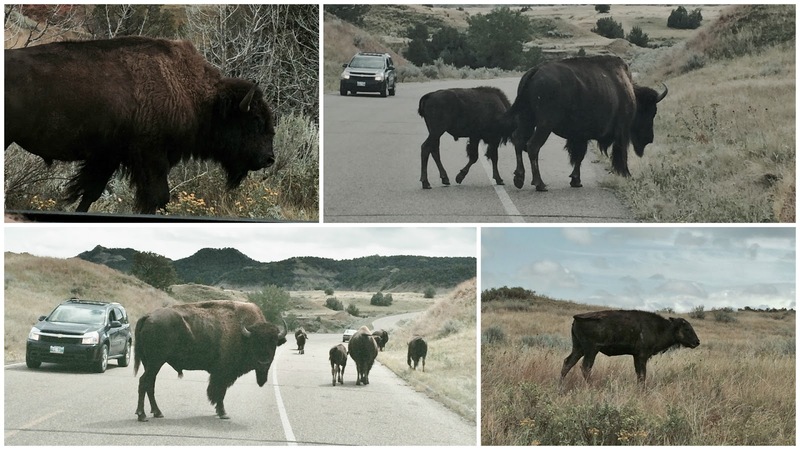 We got stopped in a Buffalo traffic jam, which was pretty cool. We saw a coyote stalking prairie dogs and horses up on a ridge. A fellow visitor snapped a picture of us. 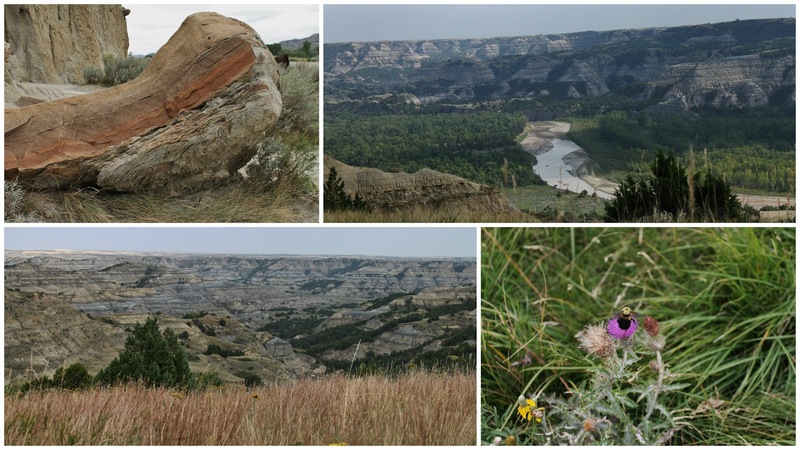 While there was a great deal more grasslands and trees in this part of the park, it did have its share of rock formations in a variety of colors and shapes. The visitor center at the south entrance has a number of historical pictures and displays. Behind the center is Theodore Roosevelt cabin that he built at his Maltese Cross Ranch. There is also the foundation and chimney to the De Mores Packing Plant that once sat on this site. 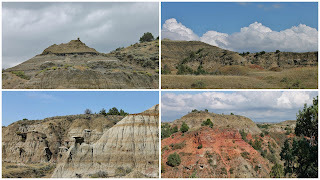 On the trip back home from the south end we stopped at the Painted Canyon. There is a large visitor center and a deck with breath taking views. There was also a large swarm of irritating bugs. We have seen such beautiful places, with even more to come. Yellowstone National Park is next! ~ Today's tip goes back to the road construction sign. Remember to look about you for reminders to be good and kind people. In today's world it is often easy to forget. As we have traveled we have seen and participated in many random acts of kindness and it is such a good feeling to know that there are a lot of good people roaming the earth.